Itron completed its acquisition of Silver Spring Networks in January, officially uniting the country’s two biggest providers of smart meters, grid networks, and software and services. The combined company has more than 90 million “endpoints” and counting. On Monday, Itron reported quarterly earnings for the first time as an integrated company, revealing Silver Spring’s share of now-bolstered revenue streams and project backlogs. For the first quarter of 2018, Itron reported total revenue of $607 million, up 27 percent from $478 million in the first quarter of 2017. This included $86 million of revenue provided by the “Networks segment” — Silver Spring’s new name — without which total revenue would have grown only 9 percent. Silver Spring also provided $1.4 billion to Itron’s total backlog of $3.1 billion at the end of the first quarter, up from $1.6 billion at the end of the first quarter of 2017. That includes 13 million total endpoints, on top of the 29 million delivered through the first quarter, CEO Philip Mezey said on Tuesday’s conference call. The Networks segment was also responsible for several of Itron’s big project wins and contract extensions. Those include a contract with Jamaica’s primary utility to “unify 670,000 electric meters under Itron's smart grid network,” building on previous deployments of 51,000 electric meters in 2016 and 2017 and 37,000 smart street lights in 2017. Another big Silver Spring contract with Florida Power and Light, involving managed services for 4.9 million electric meters, 27,000 distribution devices and more than 500,000 street lights, got a seven-year renewal in March. 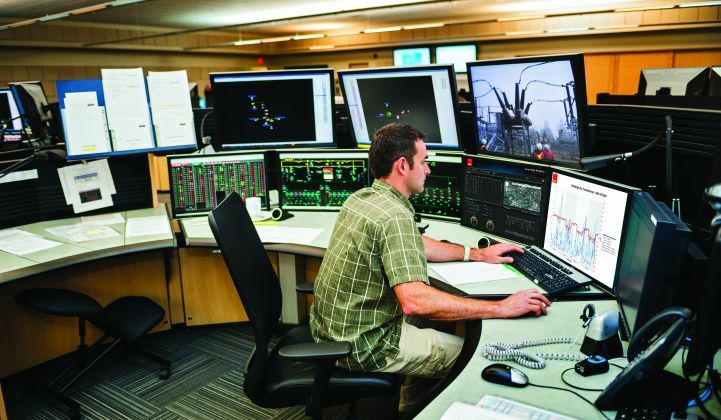 This network helped FPL with “intangible benefits during Hurricane Irma in September of 2017,” Mezey noted, as part of its communication and automation systems that prevented more than 500,000 outages during the hurricane, and restored service to a million customers before the storm had completed its course through the state. At the same time, acquisition costs and accounting adjustments played a role in driving down Itron’s gross margins for the quarter to 29.6 percent, down from 33 percent in the same quarter last year. Mezey blamed most of the reduction to “incremental cost associated with manufacturing transitions,” as well as rising prices for electronics components and commodities. Itron reported non-GAAP diluted earnings per share of 13 cents for the quarter, compared with 57 cents in the first quarter of 2017. That was slightly above the midpoint of the guidance range the company had provided, but a “bit lower than we expected due to elevated costs related to factory and supply chain transitions, product mix and higher cost of materials,” he said. Itron’s electric, gas and water metering segments all reported strong growth, with contracts from multiple utilities and municipalities across North America, including 193,000 meters for Southern Company subsidiary Mississippi Power, and annual orders for ongoing contracts with Enedis in France and PLN in Indonesia. Itron’s Distributed Energy Management segment — its new name for Comverge, the demand response provider it bought for $100 million in May 2017 — also won some big contracts in the quarter. In January, it landed a 60-megawatt demand response project with Public Service Company of New Mexico targeted at residential and small commercial customers. Other wins included a three-year agreement with Northwest Iowa Power Cooperative and a contract with Santiago Gas and Electric to manage distributed energy resources, Mezey said. On the advanced electric metering side, Itron’s OpenWay Riva platform continued to gain customers in North America, Mezey said. This open-standards-based, multi-communications network is now running devices with Linux-based processors that can be programmed to act like computers in the field, providing far more upgradeability and flexibility than previous generations of smart meters. Silver Spring’s Gen5 platform, which provided many of the same features as Itron’s OpenWay Riva, is now being integrated into a common framework, Mezey said. "We are further along in our plans to certify Itron metering and endpoints underneath the Silver Spring network in order to create cross-selling opportunities,” which will largely be focused on distribution automation and street lighting. During the conference call, Needham & Co. analyst Sean Hannan asked Mezey how the Gen-5-Riva integration might serve as a “launch pad for you...in getting more involved around various ancillary IOT technologies.” Mezey replied that Itron has been "demonstrating other types of sensors and modules that are connected onto the network, and we see a longer-term developing opportunity there as well." But the company is going to start out "looking at meters and modules and cross-selling of [distribution automation] and streetlights and software opportunities for near-term benefits." Itron is planning to unveil more details of its plan to harmonize Gen5 and Riva technologies in the second half of 2018. Jeffrey Osborne, an analyst with Cowen & Co., noted that both companies “share similarities and chipsets,” providing a logical path for integrating the two networking platforms. In part, that similarity has been driven by the two companies' common membership in the Wi-Sun Alliance, a group developing implementations of the IEEE 802.15.4g standard for the unlicensed spectrum wireless mesh networks used by most North American utilities. Other Wi-Sun Alliance members include Cisco, a key partner in Itron’s implementation of OpenWay Riva, and Landis+Gyr, Itron’s chief competitor in the global AMI market. All have united behind 802.15.4g as the IOT network of the future, in competition with low-power wide-area networks like LoRa and cellular alternatives such as narrowband IOT.